Every Wednesday is a Pink Wednesday at Baskin-Robbins! All you got to do is show up with something pink to BR staffs, for example, finger nails painted in pink, pink pen, pink handphone, pink shirt, pink tie,... anything PINK to enjoy the PINK deal! It's a great treat, especially when you're tired after a long walk or crazy shopping. 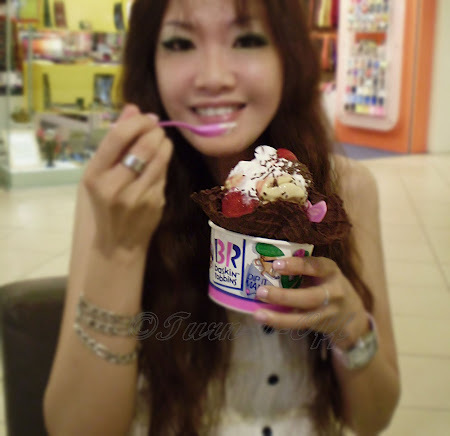 Just ignore the calories and have a BLAST Pink Wednesday at Baskin-Robbins! I used to go a Baskin-Robbins a lot as a kid since it was down the road from where I lived in OK.
No surprise to see you taking advantage of Pink Day! Haha! You could pass as a model for them in a commercial. I so love pink. It's mouth watering, Mon. Looking so yum! Yum! Wahhhh .. finally, the ice-cream stands out more than you in TUO picture. Hehe. Aiyohhhh lama betul tak makan ice-cream. I didn't know about this pink deal at BR. But then again, I dah tawar hati with BR (Taipan branch) ever since I found a fly in my ice cream and complained to the manager and wrote to the HQ but no one got back to me. It wasn't necessarily about the fly in the ice cream, but how rude the employee was when I went back to show them. Urgh. Stress just thinking about it. So anything pink also can? Hmmm, why pink? Must be targetting girls! LOL! 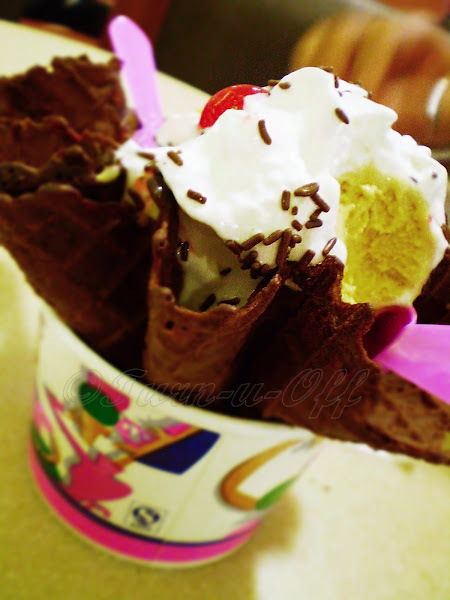 I love Baskin and Robbins....but at this time here , I think eating ice cream won't help me feel warm.